Michael Hobbiss celebrates his brilliant 166 for Burghley Park against Houghton & Wyton. Photo: J Biggs Photography. Mike Hobbiss cracked a brilliant 166 for Burghley Park in a massive 292-run win over Houghton & Wyton in Hunts Division One. Burghley scored 319-5 in 45 overs before skittling their visitors for 27 with Michael Jones taking 6-8. An eight wicket haul for Colin Cheer of Bourne (right). Hobbiss’ knock was enough to top the Peterborough Telegraph merit table batting charts. Colin Cheer’s 8-43 for Bourne at Boston was the best bowling performance of the week. Pete Rowe’s 124 not out for Ketton Sports against Great Glen was a second successive Leicestershire League ton. 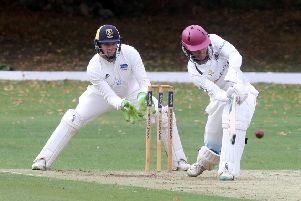 Hayden Bream’s 7-21 helped Sawtry skittle Alconbury for 78 in a Rutland Division Two match. Middle order man Marcus Papworth smacked a 90-ball 102 as Orton Park inflicted a first Hunts Division One defeat of the season on Eaton Socon seconds. The city side won by 126 runs after scoring 231-6.